"Morse and Yi (the team behind What Is Punk?) highlight hip-hop's cultural hegemony via an impressively encyclopedic parade of rhyming biographies. Yi's meticulously styled clay figures are as magical as in the previous book, combining profound expressiveness with the playfulness of action figures. Her compositions are equally evocative, ranging from video snippets (the Beastie Boys strike a pose from 'Intergalactic') to formal portraits (Kanye West, Missy Elliott, Kendrick Lamar) and metaphorical ones (Jay Z stands amid New York City skyscrapers)." "In rhythmic, rhyming verse, Morse offers a genealogy of hip-hop royalty that begins with the Boogie Down Bronx's DJ Kool Herc and Grandmaster Flash and walks readers into today with Nicki Minaj, Drake, and Kendrick Lamar. In between the origins and now, readers find a rare gender-inclusive narrative of hip-hop history that uplifts B-girls like Queen Latifah and Missy Elliott along with legendary male groups such as NWA and Wu-Tang...The magnificent 3-D clay illustrations...include an intricately produced remake of Tribe Called Quest's legendary 'Midnight Marauders' cover. Tying these images back to their original sources makes for quite the history lesson. Make sure to keep a device nearby. A must-read reference for any hip-hop family." "Verdict: these books are pretty damn cute." 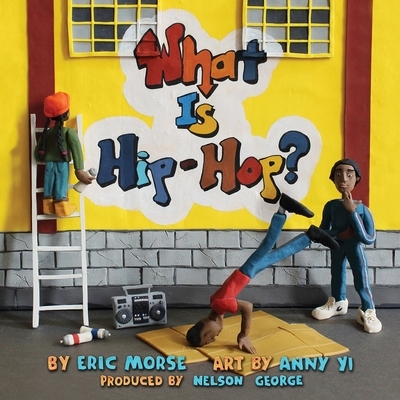 "An ideal picture book for children ages 3 to 7, What Is Hip-Hop? is as entertaining as it is informative and will prove to be an enduringly popular addition to family, daycare center, preschool, elementary school, and community library collections." "Eric Morse is back with a follow-up that shines a similar PG spotlight on the hip-hop arena and its players, from Run-DMC and Queen Latifah to Salt-N-Pepa and Tupac. Artist Anny Yi returns, too, with delightful clay figurines to accompany Morse's beat-astic rhyming verse." Praise for What is Punk? "A punk primer for the youngest set. Yi's incredibly detailed clay figures are a kinetic and inspired art choice. As Morse] points out, the best way to learn about punk is just to listen. If invested adults love the topic, a shared reading experience can't be beat." "What Is Punk? is a fun, sophisticated, and beautifully illustrated introduction to the music genre for kids--or adults." "In the beginning, there was a beat..." So begins What is Hip-Hop?--a playful guided tour of one of the most revolutionary pop culture movements of the twentieth century. Beginning with block parties in the Bronx, What is Hip-Hop? brings the reader up to the present day, with rhyming verses and engaging 3-D clay illustrations. It's a fun, accessible, and informative read for B-boys and B-girls of all ages. In the follow-up to their acclaimed and beloved hit What Is Punk? author Eric Morse and artist Anny Yi reunite to celebrate the music that changed their lives and the voices that achieved iconic status along the way. See Run-D.M.C., LL Cool J, Beastie Boys, Salt-N-Pepa, Biggie and Tupac, Eminem, and even Nicki Minaj and Kendrick Lamar, as you've never seen them. Eric Morse is a writer and father of four living outside of New York City. He was the founder and editor of Trampoline House online magazine, and a music industry marketing executive. When he's not listening to old hip-hop records, he's listening to new hip-hop MP3s. Eric is also the author of What Is Punk? Anny Yi is an artist from Los Angeles, California. She makes clay-art dioramas and stop-motion films inspired by fashion and music. Anny Yi is the illustrator of What Is Punk? and What Is Hip-Hop? Nelson George ("producer" of this book) is an author, filmmaker, and life-long resident of Brooklyn, New York. His novels include The Accidental Hunter, The Plot Against Hip Hop, The Lost Treasures of R&B, and the forthcoming To Funk and Die in LA (all part of the D Hunter series). Among his many nonfiction works are The Death of Rhythm & Blues, Hip Hop America, and The Hippest Trip in America: Soul Train and the Evolution of Culture & Style. As a filmmaker he's directed the documentaries A Ballerina's Tale, starring Misty Copeland, Brooklyn Boheme for Revolt, The Announcement for ESPN, and Finding the Funk for VH1, and serves as supervising producer for Baz Luhrmann's Netflix series The Get Down.